Experience the celebrated film The Insider on Blu-ray for the first time with a new digital restoration. 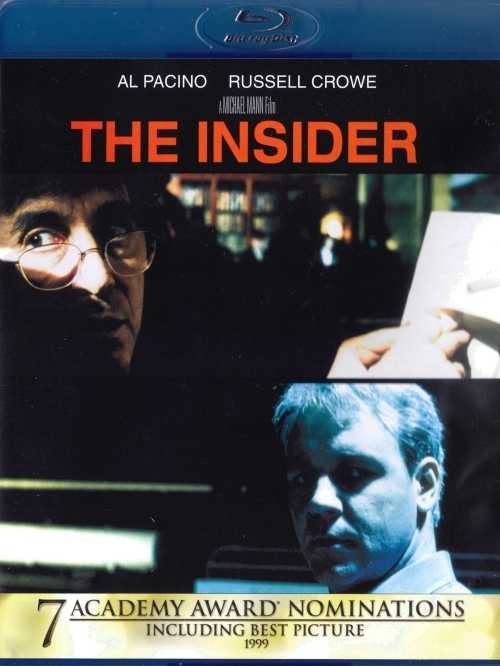 Nominated for 7 Academy Awards (1999), including Best Picture, Best Director and Best Actor, this gripping true-life drama features an astonishing cast, including Oscar winners Al Pacino (Best Actor, 1992, Scent Of A Woman), Russell Crowe (Best Actor, 2000, Gladiator) and Christopher Plummer (Best Supporting Actor, 2011, Beginners). Witness the incredible chain of events that pitted an ordinary man against the tobacco industry and dragged two people into the fight of their lives. When former tobacco executive Dr. Jeffrey Wigand agrees to blow the whistle on the alleged unethical practices within the industry and forms an alliance with veteran 60 Minutes producer Lowell Bergman, he starts an all-out war that could cost both men their reputations... and much, much more.